Ness in the 100-Man Melee. Multi-Man Smash (組み手, Group Combat) is a Stadium sub-mode appearing in Super Smash Bros. Melee as Multi-Man Melee, Super Smash Bros. Brawl as Multi-Man Brawl, Super Smash Bros. 4 as Multi-Man Smash, and Super Smash Bros. Ultimate as Mob Smash. This sub-mode pits the player against multiple consecutive simultaneous foes, challenging them to defeat as many as possible under various pretenses, while additionally allowing for more characters to be on-screen than allowed under normal circumstances. Though the player has only one stock, the enemy team generally sustains high knockback (moves with high enough base knockback are usually enough to OHKO them), has a low artificial intelligence level, and lacks the ability to perform special moves or grab ledges, making them easy to KO. The mode's difficulty arises from the fact that though individual opponents can be very easy to defeat, it becomes hard to divide one's attention among as many as five opponents at once, making it easy to slowly rack up damage taken over the course of the mode until one or more stray attacks can KO the player. Multi-Man modes take place on Battlefield, and starting with Ultimate, any Battlefield form can be chosen. Mario and Sonic in Co-op 3-Minute Brawl. Ryu and his Rival in Rival Smash in Super Smash Bros. for Nintendo 3DS. 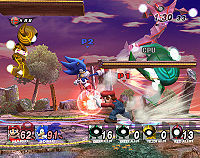 Six Multi-Man modes are available per game, with Rival mode replacing 15-Minute mode in SSB4 for a total of seven different Multi-Man modes throughout the series. 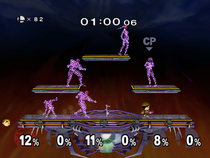 In Super Smash Bros. 4, as with any Stadium sub-mode, players are not allowed to use customizations, preventing players from using equipment to augment their characters' power or bypass the game mode's restrictions. As such, excluding the Mii Fighters, fighters are only allowed to use their default special moves. 10-Man - challenges the player to defeat ten opponents. This is the shortest of all the Multi-Man challenges, usually taking between 10 and 20 seconds to complete for an amateur player, though world records are all within roughly 6 and 7 seconds. 100-Man - challenges the player to defeat 100 opponents, which get tougher as the mode continues. This usually takes a few minutes for players to clear, and can get quite difficult towards the end of the mode. The final Wire Frame to be fought will always sustain noticeably less knockback than the others. 3-Minute - challenges the player to survive for 3 minutes, defeating as many opponents as possible. 15-Minute (Melee and Brawl only) - challenges the player to survive for 15 minutes, defeating as many opponents as possible. Foes get stronger as time passes by. Despite the need for endurance, simple strategies such as spamming a certain move or evading the opponents altogether will generally suffice. Rival (SSB4 only) - challenges one player to defeat more opponents than their Rival (an AI copy of their character) before they are themselves defeated in an otherwise endless match. Rivals respawn after being KO'd. The player's final score is equal to the difference of number of opponents they and their Rival defeated. This mode replaces 15-Minute mode in SSB4. Endless - challenges the player to defeat as many opponents as possible before being KO'd themselves. It has no time limit nor enemy KO limit, and as such can go on for an indefinite amount of time. Cruel - challenges the player to defeat as many opponents as possible before being KO'd themselves, like Endless mode, but now the opponents have high handicap instead of the player, as well as increased aggressiveness and a high AI level. Additionally, no items will appear. This is unarguably the most difficult Multi-Man mode, as the opponents are immensely harder to KO while the player is also much easier to KO compared to the other modes. Each game in the series features different enemy teams to fight against in Multi-Man modes: in Melee the Fighting Wire Frames, in Brawl the Fighting Alloy Team, and in SSB4 the Fighting Mii Team. Fighting Wire Frames (Melee) - purple-colored male and female wireframe humanoids. Male Wire Frames are based on Captain Falcon, while the Female Wire Frames are based on Zelda. They cannot charge smash attacks, and despite being based on Captain Falcon and Zelda, their attacks also have no fire, electric, or magic effects. Fighting Alloy Team (Brawl) - metallic fighters based on four characters in the game. Red alloys are based on Captain Falcon, Blue Alloys are based on Zelda and Zero Suit Samus, Yellow Alloys are based on Mario, and Green Alloys are based on Kirby and Jigglypuff. Despite being based on Zelda, Blue Alloys lack magic and fire attack effects. They cannot grab items nor receive giant, tiny or flower status effects. Every 25th opponent fought is spawned as a character, and the final opponent is a palette swap of the player's character. Fighting Mii Team (SSB4) - Mii Fighters wearing black jumpsuits with a white "M" letter printed on its anterior and two white "i" letters around their limbs. Their skin and facial appearances cull from Miis saved on the player's console, or from pre-loaded/guest Miis if there aren't enough. Despite this, their height and weight are all uniform. They can recover by footstool jumping off each other despite not being able to attack each other otherwise. Every 50th opponent fought is spawned as a giant character, and the final opponent in 100-Man Smash is a giant version of the player's character. Fighting Mii Team (SSBU) - Mii Fighters wearing black jumpsuits with a white "M" letter printed on its anterior and two white "i" letters around their limbs again. For balancing reasons, certain items do not spawn in Multi-Man Melee and Multi-Man Brawl, and only a select few appear in Multi-Man Smash. Additionally, no items will spawn at all in Cruel mode. Multi-Man Melee - Food, Maxim Tomatoes, Heart Containers, Hammers, Barrels, Crates, and Party Balls do not spawn. Additionally, Capsules are always explosive and Poké Balls cannot spawn Legendary Pokémon. Multi-Man Brawl - Food, Maxim Tomatoes, Heart Containers, Hammers, Barrels, Crates, Party Balls, Rolling Crates, Sandbag, Golden Hammers, Dragoon Parts, Team Healers, and Smash Balls do not spawn. Capsules are always explosive and Poké Balls cannot spawn Legendary Pokémon. Multi-Man Smash - in the following set order, these select items float by on a platform every 30 seconds: POW Blocks, Ray Guns, Smart Bombs and Killer Eyes. No other items spawn outside of these. Ness prepares to fight the Fighting Polygon Team in Stage 10 of 1P Game. 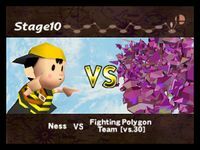 In Super Smash Bros., Stage 10 of the 1P Game is a battle on Battlefield versus 30 Fighting Polygons, which are purple polyhedrons modeled after the 12 characters in the game. They cannot grab or use special moves, and have reduced power, weight, and tendencies for shielding and dodging attacks, all of which change with the set difficulty level. This existed prior to the "Multi-Man" moniker that is applied retroactively to this scenario due to the similarity between the two. Classic Mode features certain stages with Multi-Man battles versus clones of a certain character. The Yoshi Team appears in Stage 2 in 1P Game as a group of 18 in Super Smash Bros. In Melee, 10 Yoshis appear in Stage 1 of Adventure Mode and 29 Yoshis plus a giant Yoshi in Event 24: The Yoshi Herd. In Brawl, six Yoshis appear in Event 11: Yoshi's Rainbow and 50 Yoshis in Co-Op Event 5: The Yoshi Team of 50. The Kirby Team appears in Stage 7 of 1P Game in Super Smash Bros., featuring seven Kirbys with Copy Abilities plus either one without a Copy Ability or a secret character. In Melee, 15 Kirbys with Copy Abilities appear in the second part of Stage 5 of Adventure Mode, 15 Kirbys with Copy Abilities in Event 28: Puffballs Unite!, and 10 Kirbys that can only be defeated by Warp Stars in Event 16: Kirby's Air-raid. In Melee, the first part in Stage 11 of Adventure Mode is a Multi-Man match with reduced gravity versus 15 giant Fighting Wire Frames. In Melee, the final stage of All-Star Mode is a battle against 25 Mr. Game & Watches. In Melee, Event 22: Super Mario 128 is a battle against 128 mini Marios. In Melee, Event 37: Legendary Pokémon is a match versus four giant Fighting Wire Frames and a red Jigglypuff. Poké Balls are the only items that appear, holding Legendary Pokémon or Wobbuffet. In Super Smash Bros. for 3DS, a Multi-Man match is one of possible Final Battles in Smash Run, where the Fighting Miis along with metal and giant metal versions of the player character appear. In Ultimate, certain spirit battles feature fighting many opponents, with some only appearing after others are defeated. Each member of the enemy teams in all Multi-Man modes weigh the same as Mario, except for the Female Wire Frame in Melee, who weighs the same as Zelda. Clearing 100-Man mode for the first time gives the player the opportunity to unlock an unlockable character via a 1 vs. 1 battle if the character has not been unlocked yet: Falco in Melee and Brawl and Wario in SSB4. The Fighting Mii Team cannot wear hats even if the Miis their appearances are based on wear them. They also do not change their facial expressions in battle. The Fighting Mii Team can have varied head shapes, so when inflicted with the flower ailment, it sprouts from the back of their necks rather than from their heads. Prior to version 1.0.4, a glitch in Super Smash Bros. for 3DS allowed players to use Egg Lay repeatedly to increase the size of giant opponents. The final boss of the eShop game Kirby Fighters Deluxe, Team DDD, is modeled after Multi-Man mode, consisting of 61 Mini Dededes, two medium-sized Combo Dededes, and King Dedede himself. This page was last edited on March 12, 2019, at 13:33.